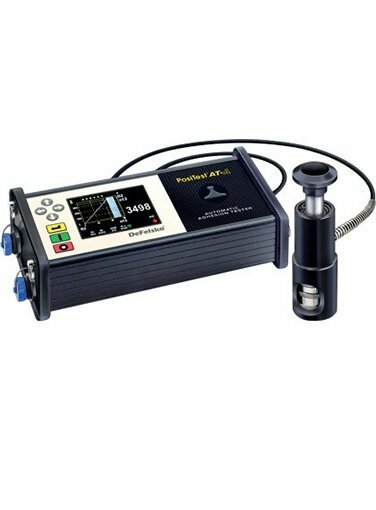 The DeFelsko ATA20A-B PosiTest ATA20 Automatic Pull-off Adhesion Testers with 20mm Kit measures the force required to pull a specified test area of coating away from a substrate using hydraulic pressure. An electronically controlled hydraulic pump automatically applies smooth and continuous pull-off pressure. The pump greatly reduces user effort and the risk of influencing the pulling process. The DeFelsko Positest AT-A features an environmentally sealed enclosure. It is weatherproof, dustproof and shockproof. Meeting or exceeding IP65 rating. User adjustable dolly size, pull rate, pull limit and hold time. View test parameters and reading results. Reading is recorded as pass or fail based on set test parameters. The pass/fail results can be revised. The cohesive and adhesive fracture visual analysis can be recorded using the PosiTest AT-A's keypad or touch screen display. Alternatively, the information can be reported using the PosiTector App. The PosiTest AT kits come complete with Automatic Adhesion Tester, built-in rechargeable NiMH battery with charger, dollies, abrasive pad, cutting tool, glue with mixing sticks and palettes, cotton swabs, USB cable, PosiSoft Software, instruction booklet and video, shoulder strap, Certificate of Calibration traceable to NIST, two-year warranty, and a sturdy, lightweight carrying case. Is the PosiTest AT calibrated at the factory? The PosiTest AT arrives fully calibrated and ready to measure. A Long-Form Certificate of Calibration traceable to NIST or PTB is included, which documents actual readings taken by your instrument at our calibration laboratory on standards traceable to a national metrology institute. Beware of ‘Certificates’ or ‘Certificates of Conformance’ offered by competitors. These typically do not include actual instrument readings, and are often insufficient to meet common quality requirements. Is the PosiTest AT portable, and suitable for use in the field? Absolutely. With an environmentally-sealed, metal enclosure, heavy-duty hydraulic pump and a high grade industrial pressure sensor, both the Manual and Automatic PosiTest AT are built to last. Weatherproof, dustproof and shockproof, they can be used indoors, outdoors and in all types of weather (meets or exceeds IP 65). For added utility and convenience, PosiTest AT-A Automatic models also include a handy shoulder strap and rubberized grips. Does the PosiTest AT include steel loading fixtures (dollies)? The PosiTest AT is supplied with self-aligning dollies that are precision-manufactured from strong and lightweight aluminum alloy (6061-T6). As a lower-cost alternative to steel loading fixtures, factory aluminum dollies are a single-use/consumable item and ideal for keeping as a permanent visual record of testing. Do you have a recommended adhesive for my particular application? The ResinLab EP11HT epoxy adhesive supplied with the PosiTest AT is simple to use and suitable for testing a wide range of coating types. In some instances, specialized coatings will require a more specialized adhesive. Is the PosiTest AT-A more accurate than the PosiTest AT-M? The certified accuracy of both PosiTest AT models is identical. However, the fully automatic design of the PosiTest AT-A provides improved measurement consistency by eliminating the potential for operator influence from the test process. What is the difference between the 20mm and the 50mm loading fixtures? The 50 mm dolly is commonly recommended for use with concrete, wood and composite substrates, and measures coatings with expected adhesion values between 50 psi and 560 psi (50 - 500 psi for AT-M models). The 20 mm dolly is recommended for testing coatings applied to metals or with expected adhesion values greater than 500 psi. Can I use the PosiTest AT-A on curved surfaces? Yes. Feedback from our customers is that the PosiTest AT gages are suitable for testing most internal or external pipe applications greater than 200 mm in diameter. In such cases, the maximum glue gap between the surface of the 20 mm dolly and the coating is 0.5 mm. For smaller pipe diameters, depending on the expected pull-off strength of the coating, it may be possible to use a 10 mm or 14 mm dolly. External diameters can be decreased to as low as 50 mm and 100 mm, for the 10 mm and 14 mm dollies, respectively. Manufacturers do do not provide or support the use of curved dollies for adhesion testing. In addition to affecting the surface area used in calculating pull-off strengths and the direction of the force lines (creating unwanted shear forces), most adhesion testing standards specifically call for the use of flat dollies. How many measurements can I take with the PosiTest AT-A on a single battery charge? The rechargeable battery pack (user replaceable) in the PosiTest AT-A can perform over 200 tests on a single charge. Use the included AC adaptor to continue testing as the battery recharges. What is the lowest adhesion strength that the PosiTest AT-A can measure? When utilized with a 50mm dolly, the PosiTest AT is in a priming state until reaching a priming pressure of 50 psi. It is only after the priming pressure is reached that the instrument begins calculating and displaying the pull rate. While it is possible to obtain readings below this priming pressure with the AT-M model, the AT-A automatic does not allow the operator to build priming pressure very slowly and is therefore not suitable for use below the priming pressure of 50 psi. Note that all reported adhesion values (including those obtained below the priming pressure) are subject to the PosiTest AT gage’s full-scale accuracy of ± 1% (± 30 psi, AT-M; ± 35 psi, AT-A). Is there a faster curing adhesive than the epoxy supplied with the PosiTest AT? The versatile epoxy adhesive supplied with the PosiTest AT reaches full cure within 24 – 48 hours. Operators who require faster cure times should evaluate other adhesives for their compatibility with both the coating being tested and our aluminum test dolly. Cyanoacrylate (‘super glue’) type adhesives are often sufficient for lower pull-off strengths. Can I use the PosiTest AT on flexible or brittle substrates? The PosiTest AT is designed for use with rigid, structural substrates. A flexible substrate can adversely impact test accuracy and repeatability. Furthermore, use of the PosiTest AT for measuring the adhesion of coatings applied to a brittle substrate typically results in the destruction of the substrate material, making it challenging to quantify the coating-substrate bond strength.